← left spinning wildly…or is it, Left, spinning wildly ? 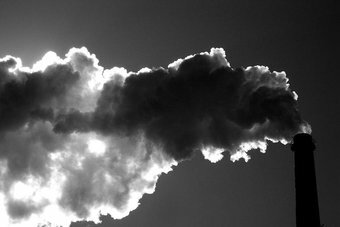 We may have seen the last of the propaganda pictures of black smoke belching out of power stations, to show how much pollution that the burning of fossil fuels makes. That is, carbon dioxide pollution, or emissions by those ‘durdy polluders’ as our Prime Minister describes it. 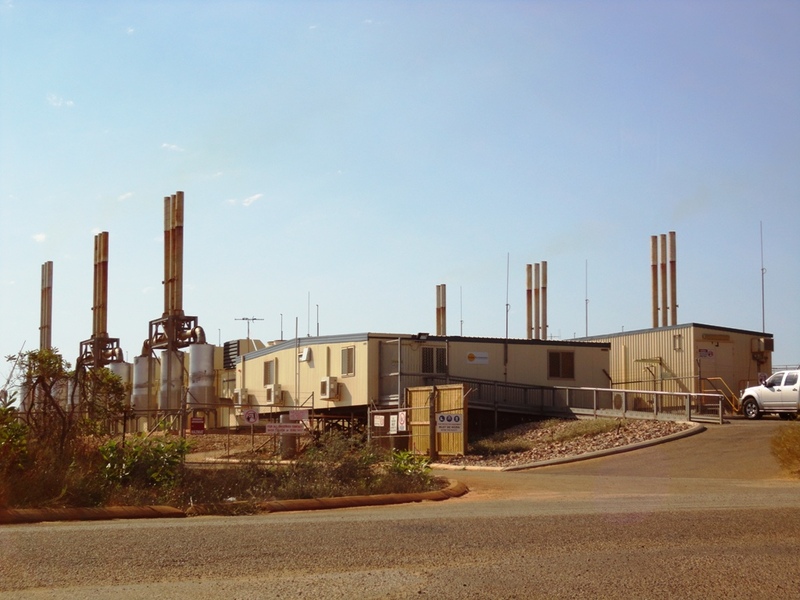 Broome used to have a large shed full of huge and noisy diesel engines running the generators that produced our power. Thankfully they are now silent, but black smoke did pour out of these smoke stacks until then. 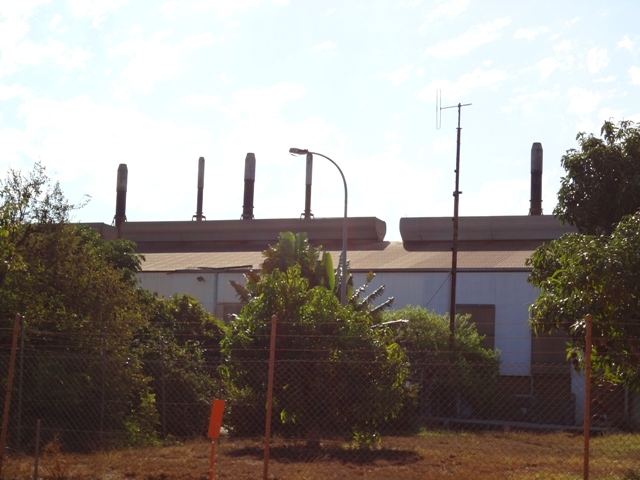 So recently I checked out the current state of pollution pouring out at the new power station. Nope, can’t see anything. Oh, and really quiet too. 18 stacks show nothing visible, but I do know that lots of plant food CO2 are being emitted. From fossil fuels no less. 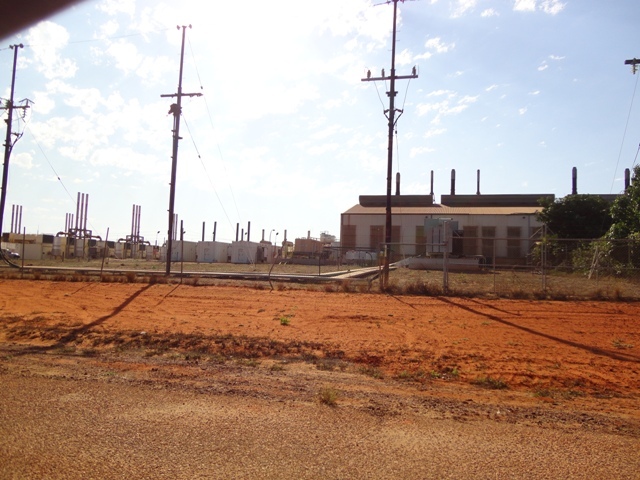 Gas, liquefied natural gas, that is, trucked here weekly from Port Hedland 600 km down the road. Climate exaggeration looks like it’s not just from Gore’s “climate fiction technicians,” but media presenters too. Science fiction writers can learn from them. Oops, sorry, they are science fiction writers already, and bad ones at that. Carbon dioxide just happens to be colourless and odourless, but the trees love more of it. Which would you rather have in the view from your house? A thing about the size of a domestic garage, or eight towers twice the height of Nelson�s column with blades noisily thrumming the air. The energy they can produce over ten years is similar: eight wind turbines of 2.5-megawatts (working at roughly 25% capacity) roughly equal the output of an average Pennsylvania shale gas well (converted to electricity at 50% efficiency) in its first ten years. Difficult choice? Let�s make it easier. The gas well can be hidden in a hollow, behind a hedge. The eight wind turbines must be on top of hills, because that is where the wind blows, visible for up to 40 miles. And they require the construction of new pylons marching to the towns; the gas well is connected by an underground pipe. Unpersuaded? Wind turbines slice thousands of birds of prey in half every year, including white-tailed eagles in Norway, golden eagles in California, wedge-tailed eagles in Tasmania. There�s a video on Youtube of one winging a griffon vulture in Crete. According to a study in Pennsylvania, a wind farm with eight turbines would kill about a 200 bats a year. The pressure wave from the passing blade just implodes the little creatures� lungs. You and I can go to jail for harming bats or eagles; wind companies are immune. Still can�t make up your mind? The wind farm requires eight tonnes of an element called neodymium, which is produced only in Inner Mongolia, by boiling ores in acid leaving lakes of radioactive tailings so toxic no creature goes near them. Not convinced? The gas well requires no subsidy � in fact it pays a hefty tax to the government � whereas the wind turbines each cost you a substantial add-on to your electricity bill, part of which goes to the rich landowner whose land they stand on. Wind power costs three times as much as gas-fired power. Make that nine times if the wind farm is offshore. And that�s assuming the cost of decommissioning the wind farm is left to your children � few will last 25 years. Decided yet? I forgot to mention something. If you choose the gas well, that�s it, you can have it. If you choose the wind farm, you are going to need the gas well too. That�s because when the wind does not blow you will need a back-up power station running on something more reliable. But the bloke who builds gas turbines is not happy to build one that only operates when the wind drops, so he�s now demanding a subsidy, too. What�s that you say? Gas is running out? Have you not heard the news? It�s not. Till five years ago gas was the fuel everybody thought would run out first, before oil and coal. America was getting so worried even Alan Greenspan told it to start building gas import terminals, which it did. They are now being mothballed, or turned into export terminals. A chap called George Mitchell turned the gas industry on its head. Using just the right combination of horizontal drilling and hydraulic fracturing (fracking) – both well established technologies – he worked out how to get gas out of shale where most of it is, rather than just out of (conventional) porous rocks, where it sometimes pools. The Barnett shale in Texas, where Mitchell worked, turned into one of the biggest gas reserves in America. Then the Haynesville shale in Louisiana dwarfed it. The Marcellus shale mainly in Pennsylvania then trumped that with a barely believable 500 trillion cubic feet of gas, as big as any oil field ever found, on the doorstep of the biggest market in the world. Rural Pennsylvania is being transformed by the royalties that shale gas pays (Lancashire take note). Drive around the hills near Pittsburgh and you see new fences, repainted barns and – in the local towns – thriving car dealerships and upmarket shops. The one thing you barely see is gas rigs. The one I visited was hidden in a hollow in the woods, invisible till I came round the last corner where a flock of wild turkeys was crossing the road. Drilling rigs are on site for about five weeks, fracking trucks a few weeks after that, and when they are gone all that is left is a “Christmas tree” wellhead and a few small storage tanks. The International Energy Agency reckons there is quarter of a millennium’s worth of cheap shale gas in the world. A company called Cuadrilla drilled a hole in Blackpool, hoping to find a few trillion cubic feet of gas. Last month it announced 200 trillion cubic feet, nearly half the size of the giant Marcellus field. That�s enough to keep the entire British economy going for many decades. And it’s just the first field to have been drilled. Jesse Ausubel is a soft-spoken academic ecologist at Rockefeller University in New York, not given to hyperbole. So when I asked him about the future of gas, I was surprised by the strength of his reply. “It’s unstoppable,” he says simply. Gas, he says, will be the world�s dominant fuel for most of the next century. Coal and renewables will have to give way, while oil is used mainly for transport. Even nuclear may have to wait in the wings. And he is not even talking mainly about shale gas. He reckons a still bigger story is waiting to be told about offshore gas from the so-called cold seeps around the continental margins. Israel has made a huge find and is planning a pipeline to Greece, to the irritation of the Turks. The Brazilians are striking rich. The Gulf of Guinea is hot. Even our own Rockall Bank looks promising. Ausubel thinks that much of this gas is not even fossil fuel, but ancient methane from the universe that was trapped deep in the earth’s rocks – like the methane that forms lakes on Titan, one of Saturn’s moons. The best thing about cheap gas is whom it annoys. The Russians and the Iranians hate it because they thought they were going to corner the gas market in the coming decades. The greens hate it because it destroys their argument that fossil fuels are going to get more and more costly till even wind and solar power are competitive. The nuclear industry ditto. The coal industry will be a big loser (incidentally, as somebody who gets some income from coal, I declare that writing this article is against my vested interest). Little wonder a furious attempt to blacken shale gas�s reputation is under way, driven by an unlikely alliance of big green, big coal, big nuclear and conventional gas producers. The environmental objections to shale gas are almost comically fabricated or exaggerated. Hydraulic fracturing or fracking uses 99.86% water and sand, the rest being a dilute solution of a few chemicals of the kind you find beneath your kitchen sink. State regulators in Alaska, Colorado, Indiana, Louisiana, Michigan, Oklahoma, Pennsylvania, South Dakota, Texas and Wyoming have all asserted in writing that there have been no verified or documented cases of groundwater contamination as a result of hydraulic fracking. Those flaming taps in the film “Gasland” were literally nothing to do with shale gas drilling and the film maker knew it before he wrote the script. The claim that gas production generates more greenhouse gases than coal is based on mistaken assumptions about gas leakage rates and cherry-picked time horizons for computing greenhouse impact. Like Japanese soldiers hiding in the jungle decades after the war was over, our political masters have apparently not heard the news. David Cameron and Chris Huhne are still insisting that the future belongs to renewables. They are still signing contracts on your behalf guaranteeing huge incomes to landowners and power companies, and guaranteeing thereby the destruction of landscapes and jobs. The government�s “green” subsidies are costing the average small business 250,000 pounds a year. That’s ten jobs per firm. Making energy cheap is – as the industrial revolution proved – the quickest way to create jobs; making it expensive is the quickest way to lose them. Not only are renewables far more expensive, intermittent and resource-depleting (their demand for steel and concrete is gigantic) than gas; they are also hugely more damaging to the environment, because they are so land-hungry. Wind kills birds and spoils landscapes; solar paves deserts; tidal wipes out the ecosystems of migratory birds; biofuel starves the poor and devastates the rain forest; hydro interrupts fish migration. Next time you hear somebody call these “clean” energy, don�t let him get away with it. 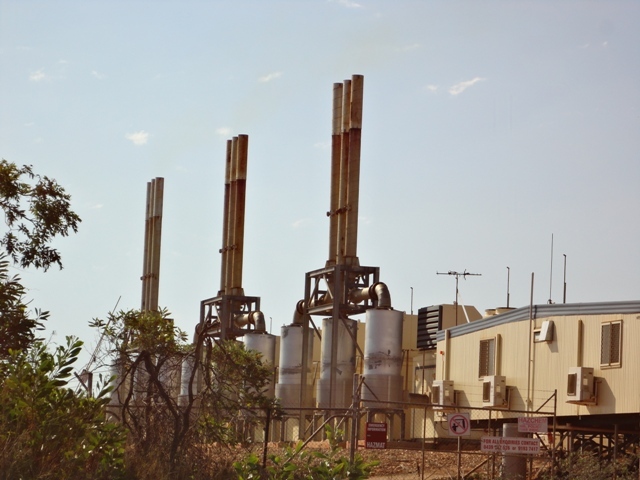 This entry was posted in Broome/Kimberley, Climate, energy, Environment and tagged Broome, carbon emissions., coal power, diesel power, gas fired power station, greenhouse gas emissions, Matt Ridley. Bookmark the permalink. the Invisible Hand has brass knucks, and powerful punching muscles driving it. When you attempt to defy it, you first start losing your teeth like “cherry Chiclets”, and then you die.